Global leaders face a host of real time geopolitical challenges, from North Korea's growing nuclear threat, to the shocking plight of the Rohingya in Myanmar, to ongoing wars including in Syria. These and many other critical issues, from creeping nationalism to the existential challenge of climate change, will be debated over the comings days. 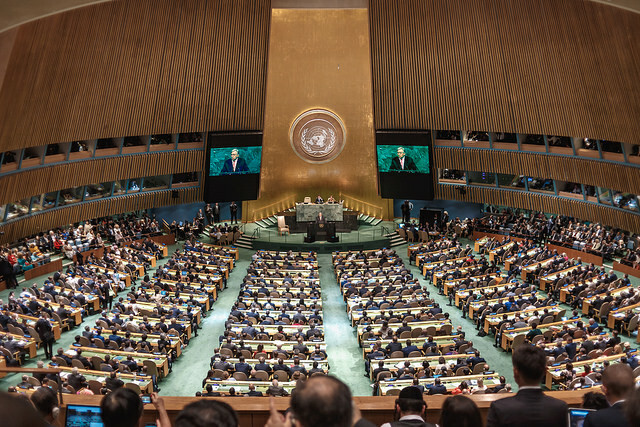 One of the first events on the agenda this week in New York was the focus on the role of business and investment in driving the UN sustainable development agenda. The UN Private Sector Forum brings together CEOs and investors with leaders from governments as well as senior UN and civil society representatives to discuss opportunities for joint action. This year, the event highlighted the need for financial innovation, responsible business growth, and greater private and public investment to meet the 2030 Development Agenda. It is certainly true that scaling up ambition and action by business is a critical component in making faster development gains over the coming decades, in particular for those who have been most marginalized from economic and social progress. A growing number of business leaders are sending strong signals that they are ready to do more in their own companies and in collaboration with others to make a positive difference. This is to be welcomed and encouraged. But if we are to make inclusive and equitable development a reality for all, governments and business leaders must avoid focusing only on development goals that appeal to their own existing interests and ongoing initiatives. Surprisingly, what too often gets left out of sustainable development strategies is the importance of placing respect for the dignity of every person at the core of business activities globally. We at IHRB, along with our colleagues from the Business and Human Rights Resource Centre, Oxfam, the International Corporate Accountability Roundtable, Shift and the Danish Institute for Human Rights sent a joint open letter to all Private Sector Forum participants, in which we stressed the hugely positive development impacts that will be achieved through improved treatment of the millions of workers and communities affected by business activities around the world. Ensuring respect for human rights, starting by implementing the UN Guiding Principles on Business and Human Rights, should be the first priority for business. We're calling on all business leaders, including those participating in this week's UN Global Compact Leaders Summit, to put human rights at the heart of how business gets done, including business efforts to contribute to the 2030 Development Agenda. We call on business to scale up their efforts to work with governments, trade unions and broader civil society in collaborative initiatives to tackle systemic challenges and to do their part to ensure that regulatory environments protect human rights, including the rights of workers and impacted communities. Business must also be transparent and accountable about their own efforts, including when they are involved in partnerships at national, regional and global levels focused on implementing the UN Sustainable Development Goals. Business commitment to these actions would make a lasting contribution to achieving the 2030 Development Agenda. Amidst all the talk this week about "raising the ambition level", achieving "collective impact", "transforming business” and "disrupting every day business models" among other catch phrases designed to inspire and promote action, we shouldn’t lose track of our commitments to enduring values. Those values call on all of us - including business - to ensure respect for the inherent dignity and equal rights of all people. Progress on respecting human rights will be the best way for business to contribute to shared security and sustainable development for all. Human rights can be front and centre in collective action and the heavens do not fall, in fact human dignity can be restored. The work of the Bangladesh Accord following the terrible Rana Plaza disaster, and the ACT Initiative on establishing a living wage in the apparel sector across the whole of South East Asia show what can be done. IHRB's work with the Leadership Group for Responsible Recruitment which brings 11 global brands together to call for the eradication of worker fees and embedding of the Employer Pays Principle in supply chains to combat forced labour and modern slavery is another example of how collective action in support of the SDGs can embrace respect for human rights. As the Secretary General said when closing his address to the UN General Assembly on Tuesday: "We call ourselves the international community. We must act as one, because only together, as united nations, can we fulfil the promise of the Charter and advance human dignity for all”.